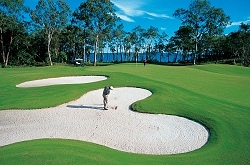 The multi award winning Noosa Springs is the only International championship golf course at Noosa Heads. It is located just 3km from Hastings Street. The resort standard course meanders along the shores of tranquil Lake Weyba and is surrounded by the natural beauty of the Noosa National Park. 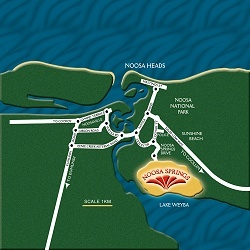 Noosa Springs has been designed by leading golf course architect, Graham Papworth. 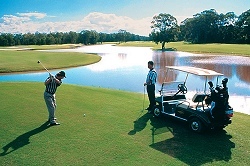 It is rated one of the best golf course in Australia. A challenge equally inspiring for low and high handicap players. Each hole is unique and offers enjoyment for everyone. 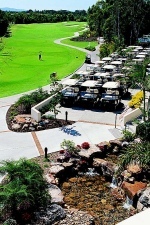 The course has a magnificent clubhouse that offers an idyllic place to relax after the game. It includes luxuriously appointed locker rooms with showers and provides an Alfresco cafe, lounges, bar and restaurant. The Golf shop is stocked with one of the best ranges of golfing apparel, gifts, accessories and equipment while there is extensive parking for cars and coaches. Noosa Springs specialises in social and business functions that can be combined with a game of golf and tailored to your exact requirements.